2018 NAIFC Ice Fishing Tournament on Hebgen Lake is Near! It is time to get serious about making your plans for the next NAIFC ice fishing tournament on Hebgen Lake! The tournament is January 14, with the other activities for fishermen, families and kids happening from the evening of Friday, January 12 through Sunday, January 14. The schedule of events is generally the same as it has been, with a change in how we are doing the Kids Ice Camp classroom session on Saturday morning. There are already 17 teams on the registration list, many fishing buddies you will recognize from past tournaments. 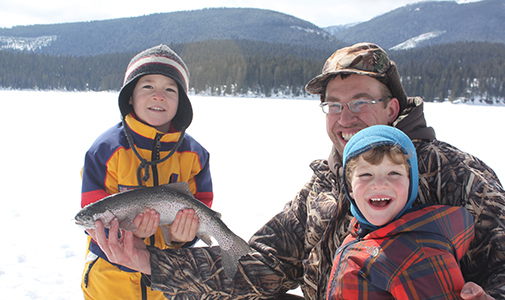 Many of you have told us that second to the fishing at this tournament, being able to get together with other fishermen who love the sport is one of your favorite things about this annual event–so come hang out–and “talk Montana ice fishing”!